Oh no! I did another flop! And it is Pine Tree, of all blocks! So many pieces, so elaborate! I don’t know what came into my head when deciding on these prints. And I took especial care to the direction of the stripe print. Boohoo! To top it off, the block is distorted like no other. Worst block so far! I thought about redoing it completely in green with a white background. But then, green is supposed to be a highlighting colour only, and I already did a wholly green block. So I finally opted for a medium dark turquoise print with a white background. The only thing I repeated is the fussy cut trunk of the pine tree. I hope you are with me when I say: Molto meglio! 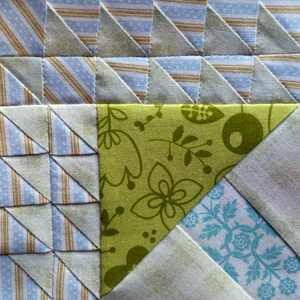 Posted in Uncategorized and tagged farmer's wife, farmer’s wife quilt, pine tree block, pine-tree, quilt, quilt block. Bookmark the permalink. Yes,molto meglio (and I had to consult the dictionary on that one) but I didn’t actually notice the stripes going in different directions on the first block until you pointed them out. You really are too kind! I still consider the first version a complete failure. But what you wrote of the quilt of “orphan” blocks made me laugh very much. 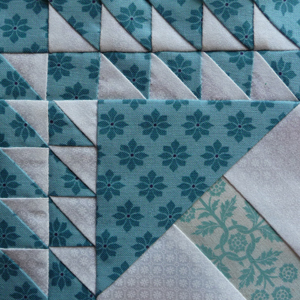 My remark on making such a quilt wasn’t meant too seriously, but now that you wrote about it … I will keep that in mind … more so since I truely hate throwing blocks away—even if they’re ugly.